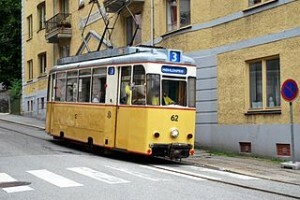 Bergen is a city that is not too difficult to transport problems. All the places in the city center can be reached on foot. Bergen was very small, in a day you can go to and from the station – as much as eight times the centrum from around the city, penetrate buildings and old streets, relax in the garden, enjoying the view of wooden houses lining the hills of the valley, climbing one of the mountains, eat in a restaurant with promo Dagens Meny, look for free internet access in the city library, in and out a few museums, bought souvenirs, to explore some of the clothing stores were having discounts. All you can do in a single day and just rely on the foot to keep moving. Sun rays extend until past 21:00 during the summer, plus eager tourists, visitors can play in Bergen centrum. It is often interfere only with the cruel cold wind blowing, several degrees colder than Oslo wind can make you be frozen stiff fingers to even hit the camera. Thick gray clouds are also visible in the sky Bergen, Bergen weather forecast says it will rain for the next few days.